India and Zimbabwe clashed for the 2nd of a two match test series. India had a comprehensive win in the first match and was expected to repeat the same in Nagpur. A double century from Tendulkar, and a 162 from Dravid took India to a mammoth total of 609 for the loss of six wickets in the first innings. A brave response from Zimbabwe (382 runs) was not sufficient to save them from follow on. With 2 full days left, and against a five man bowling attack which featured Srinath, Zaheer Khan, Agarkar, Sunil Joshi and Sarandeep Singh, Zimbabwe knew they had their work cut out. As Zimbabwe struggled at 3 for 61, India sensed another massive win. Enter Andy Flower. In the next 544 minutes of the test match, Flower denied India what was to be another simple win. Flower hit a patient unbeaten knock of 232 from 444 balls (His career best) to take Zimbabwe to safety. At the end Zimbabwe put up a defiant score of 503 runs for the loss of 6 wickets. The Indians were shocked and bewildered. Ten of their players (Except wicketkeeper) tried their luck with the ball. But they couldn't defeat the perseverance and determination of Andy Flower. Flower retired from the game with an average of over 50 in test cricket and a respectable 35 in ODIs. It must be mentioned that most of these runs were scored against the top test playing nations. West Indies were eyeing an easy win over Kenya in the 1996 World Cup Group A match. Their bowling attack, which featured Ambrose, Walsh, Bishop and Gibson, would scare the best of batsmen. As expected, Kenya struggled, wickets tumbled and they were eventually bowled out for a measly 166. It could have been worse for Kenya had it not been for Steve Tikolo. Anticipating a collapse, Tikolo played a cool, calm and collected knock of 29 which was the highest score of their innings. Kenya will thank him for those 29 runs as it was his calm approach that prevented them from being bundled out for less than 100. That evening Kenya shocked the World by beating West Indies. Chasing a paltry total of 166, West Indies collapsed for 93. This epic victory is considered one of the biggest upsets in the history of cricket. Seven years later, in the 2003 World Cup held in South Africa, Tikolo continued his impressive showing. He might have only scored 206 runs in the tournament (Bangladesh's highest scorer in the same tournament was Khaled Mashud with 99 runs from 6 matches) but his efforts helped Kenya create major upsets to get into the semi-finals. Not bad for a country without test status. He retired with a respectable average of 28.99, having scored 3421 runs in 134 ODI's. He also had a healthy first-class average of 48, proving his capability in the longer format of the game (he played in the South African domestic circuit for Border). What do Andy Flower and Steve Tikolo have in common? Both played for minnows. Yet in their prime they were both world-class batsmen who could have easily gotten into more established teams. They were not devastating batsmen and didn't have the talent of say, a Tendulkar or a Lara. Rather they were hard working, determined run scorers who became indispensable members of their respective teams. They were brave personalities who wouldn't get overawed by more illustrious opposition and had a never say die attitude. They batted with focus, guts, and persistence which helped them gain the respect of the best bowlers. They were responsible batsmen, who the team could always count on. They were anchormen, the backbone of their teams- they held the innings together and more often than not, gave the team a good platform or foundation. They knew how to bat based on the situation or circumstances. If they needed to attack they could do so. If they needed to play a last-resort, rescue type of role they could do so too. They were highly consistent-they would score runs against all types of opposition in all types of wickets. You could always depend on them to win a match, save a match, or play a fighting role in a lost cause. Both have retired as heroes and icons in their countries-and as excellent role models for the next generation. So an anchorman is someone who can hold the fort, bat for a long time, score runs at a tempo based on the situation, build partnerships, someone who the team can rely on to stay till the end. Whether batting first or chasing, the anchorman is always expected to give the team a solid platform. They will always put value on their wicket, and never throw it away no matter what. They are likely to convert starts to 50's, and 70-80's to hundreds. Their temperament, stamina, means they are capable of converting centuries to double hundreds in longer versions. In dire situations, anchorman is expected to tenaciously bail the team out. In modern day cricket, Sangakkara and Jayawardene plays this role for Sri Lanka, Younis Khan for Pakistan, Hussey for Australia, Dhoni (Previously Dravid) for India, Chanderpaul for West Indies, Kallis for South Africa. Every team needs an anchorman. In fact teams which don't possess such batsmen often have a brittle lineup. Perhaps this could be one of the reasons why Bangladesh is unpredictable when it comes to batting. Perhaps this is why we often fail to take a test match to the fifth day. Perhaps this is why we often fail to post big scores or chase down totals against both stronger and weaker teams. So who is Bangladesh's anchorman? Do we have one, did we ever have one? With a solid technique and calm mindset, Aminul Islam gave early indications that he could play this role for us. He did so in many occasions, most memorably during his century in our first ever Test match. But he couldn't do it enough to make Bangladesh more competitive or justify the immense ability he possessed. He and Tikolo are players from the same era, but compare their records and see who has achieved more. Javed Omar and Khaled Mashud had the rare temperament to hold an innings together. But they were never fluent run scorers. Rajin Saleh was another batsman who was able to play with grit and occupy the crease. In fact during a Test series against Pakistan, our then coach Dave Whatmore said he wished we had one or two more Rajins. But he too never lived up to expectations. More recently Raqibul Hasan became a contender for the position. A good technique and an organized approach helped him achieve some early success, especially in ODI's. But that was it-for some reason his performances went downhill from then on. Think about it- Raqibul and Shakib were peers at age group level, clearly one player has taken off while the other hasn't. Now we have had run scorers. Habibul Bashar, Mohd. Ashraful, Shahriar Nafees,Tamim Iqbal - they have all scored runs, in all forms of the game. Habibul Bashar, for instance, has over 3000 runs in Tests at an average of 30. But the truth is, none of them are or were anchormen. Their natural games were based on stroke making and brisk scoring, rather than holding an innings together. They could not replicate what Andy Flower and Tikolo did for their countries. They also lack(ed) the consistency and reliability we required from them to make Bangladesh a more competitive team. Perhaps our best bet is the man from Magura - Shakib Al Hasan. Shakib has a record that is unusual for a Bangladesh batsman. In both tests and ODI's, Shakib averages above 35. He has scored runs against all opposition, both in the sub-continent and beyond. With the bat, Shakib is fearless and attacks from ball number one, with very little regard to who is bowling. We have depended on him on countless occasions to rescue us or to drive us forward. He has delivered on many occasions. However, he also has the tendency to throw it away. Can you blame him though? We tend to rely on him too much-with the bat, with the ball, on the field. So given the immense responsibility we place on him, he might not exactly be the ideal person for the role. Besides, Shakib's natural game is more about attacking than holding the fort. In fact having a reliable anchorman in the top 4 will help players like Shakib, Tamim and Ashraful, as they can play their natural game; comfortable in the knowledge that there will be someone who will hang on. So it is clear that we lack an anchorman and that we are badly in need of one. This is something our selectors, head coach and team management need to seriously think about. We do have players who are capable of playing the role; it's just a matter of identifying and nurturing them. But before we do so, let's explore the making of an anchorman. Vijeta Pendharkar was always amused at her husband's eccentric routines. Vijetha who is a surgeon from Nagpur would often wake up in the middle of the night to see her husband walking around; as if sleepwalking. Her husband was actually wide awake, busy with yet another shadow practice session in the living room. Her husband, Rahul Dravid, had an obsession with shadow practice at odd hours of the day or night. The guy used to eat, drink and sleep cricket. Even at home, he was constantly working on ways to perfect his technique. In contrast with Tendulkar, Sehwag, Azharuddin, Laxman, and Ganguly, Dravid was more about technique and hard work than talent. Dravid wasn't exactly a child prodigy like Tendulkar, he developed his game with hard work and a methodical & disciplined approach. He was always the first at any practice session, and the last to leave. The man nicknamed The Wall would spend countless hours at the nets perfecting his rock-solid technique. At the time Dravid was breaking into the Indian team, Indian batsmen were known to struggle against the short ball. Most teams would prepare bouncy wickets for them, play three pacers and target to bowl around the rib cage and this formula yielded a lot of success. Dravid was one of the few Indian batsmen who played the short ball with ease, control and perfection. Dravid practiced a lot in the bouncy coir mat pitches of Bangalore to get accustomed to bounce. At the nets, he would get some of his teammates to chuck wet tennis ball from 12-15 yards to simulate a fast bouncing ball. His early coaches claim that it is this fanatical, workhorse-like approach which helped become one of the best batsmen of all time. From a young age he idolized and emulated Sunil Gavaskar for his technical mastery and he knew what he wanted to be and how he wanted to be remembered. Fact 1: An anchorman has to be a perfectionist with regard to technique. This perfectionism mostly arises out of hard work rather than talent. Think Dravid, think Bevan, think Hussey, think Younis Khan. Technique alone is not sufficient to help a batsman succeed - concentration, mental toughness and calmness are also critical. This is where Dravid was a master of the game; arguably better than some of his more illustrious peers. He had a phenomenal ability to concentrate, freeze out pressure and play with patience and calmness. In a recent tribute to Dravid by former Australian fast bowler Jason Gillespie, he mentioned in cricket it is all about who loses patience first. He mentioned good bowlers always have the ability to draw a batsman out of his comfort zone and dismiss him. Dravid on the other hand would draw the bowler out of his comfort zone with his disciplined and patient approach. He would bat for long periods, tire out the bowlers, wait for the poor deliveries then punish them with his fluent technique. He couldn't be lured, was never distracted and always batted with a plan. How was he so calm, so mentally strong? In an interview he stated he acquired this though his lifestyle and experience as a cricketer. Recently his wife elaborated on his lifestyle in an interview: relaxing by watching films and musicals, visiting book stores, reading books, yoga, meditation, visualization, taking time off to think at the beach, planning the night before the match etc. This last bit regarding planning before matches played a critical role in his success. Unlike his other colleagues, Dravid shunned nightlife and partying. Instead, he would stay back in his hotel room and visualize his game plan for the next match, how he would build his innings, how he would play each bowler. His wife claimed cricket was his life - that's all he thought about. He didn't care about gadgets, cars, perfumes, watches, but give him a bat and from the weight he could tell how good it was. Fact 2: Certain mental attributes are very important for an anchorman: he must be calm, must have the ability to play under pressure, must have good decision-making ability, must have patience and must be brave. While some are born with such attributes, these can also be developed through habit, good lifestyle and experience. So you have the technique, you have a strong mind. Is it adequate to become a world class batsman and an anchorman? Not exactly! According to Dravid, there is a third element. This element, called 'fitness', plays a key role in a batsman's ability to concentrate and bat for a long time. Dravid was known to spend a lot of time at the gym, and also doing yoga at home to develop stamina and endurance. His wife claims that he even went on a 2-3 month protein diet giving up rice, chapattis and desserts to help him improve his fitness. It has been reported that he even visited an eye specialist to learn techniques and exercises to strengthen his eye muscles. Talk about commitment and dedication! Fact 3: An anchorman needs to be at prime fitness and have considerable physical and mental stamina. You need both of these to be able to occupy the crease for a long time. Dravid's phenomenal technique, shot selection ability, disciplined approach, strong mindset, fitness and work ethic, made him a very difficult batsman to get out. You bowl to Sehwag, he will hit you all around the park but he will get out eventually. But Dravid -he could bat for 3-4 days if he wanted to. There are few batsmen in the history of the game that would put so much value in their wicket as Dravid did. It was very difficult to breach India's wall. He gave their batting lineup a lot of stability and complemented the aggression and stroke-making of Tendulkar, Sehwag, Ganguly and Laxman. He was India's anchorman and probably the best-ever batsman in the history of cricket to play that role. Fact 4: Probably one of the better descriptions of an anchorman is someone who places an enormous value on his wicket. This is one advice Dravid has given to Kohli, Raina, Rohit Sharma, Rahane and so on. Fortunately for India these youngsters are listening. How many Bangladeshi batsmen put value on their wickets? Not even out best batsman Shakib! Mushfiqur Rahim: Our captain has played this role on many occasions. He has good technique, temperament and has played many stubborn knocks in difficult, high-pressure situations. But for someone who has played top flight cricket for 8 years, Mushfiq has not developed much as a batmsan. The extra burden of captaincy and wicketkeeping also shows. Mushfiq is also guilty of being inconsistent and regularly throwing away his wicket. Like many of our other batsmen he had played a couple of gems and cameos but then he disappoints. However, at 24, he still has a lot more time to improve. Prediction: With a FC average under 30, Mushfiq is not exactly a run scorer. Inconsistency and not placing value on his wicket are two other serious negatives. Chances are he will get pushed to 6 or 7 and will play more of an Ian Healy-role rather than a run scoring one. Raqibul Hasan: Raqibul showed a lot of maturity when he started playing for the national team. He played with responsibility and a calm attitude which helped him score 8 half centuries in a short period of time. Since 2010 (shock retirement and return), Raqibul has been in and out. He hasn't done anything notable to convince the selector to give him a permanent position. Hopefully, he can figure out his game and make a strong return to the national team. Again, at 24, he has lot of time - if he wants to grow that is. Bangladeshi players need to realize careers don't end at mid 20's. In some countries, batsmen only break into the team in their late 20's. So they shouldn't give up and keep improving. Our cricketing must also have faith in such players getting them to work under specialist coaches, and giving them opportunities in A Team tours. This trend of careers ending at 25 must stop. Prediction: If he consistently does well in FC cricket, he could be a useful top 6 batsmen in the longer version of the game. Anamul Haque: It is no secret - Anamul is one of the hottest prospects in Bangladesh cricket. Some of the knocks he played in the recently concluded Under-19 WC were anchorman knocks; where he held the innings together. He has done well in his short FC cricket career and in the Bangladesh Premier League. Anamul is blessed with good technique, a positive mindset, and has the ability to build an innings. He can also play according to the situation, as demonstrated with his responsible century against Sri Lanka Under-19, followed by a destructive one against Pakistan Under-19. Hopefully with hard work and focus, Anamul can become a world class batsman and maybe our anchorman. Prediction: Anamul could make the number 3 slot his in all formats. With hard work and a bit of luck he could be our other batsman, besides Tamim, Shakib and Nasir who will average 35 plus. Mominul Haque: Anamul might be more talked about, but Mominul is not far behind in terms of potential and ability. Mominul has already impressed at Under 19, A Team and FC level. He too seems to be able to play with a cool head and hold an innings together. 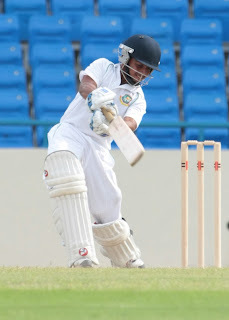 Former captain Khaled Mahmud has praised him for his maturity, good technique, and adaptability and has called him an 'educated cricketer'. Hopefully this immensely talented cricketer will live up to his potential and become a force alongside Anamul. Virat Kohli, Rohit Sharma and Suresh Raina will say that they owe a lot to the likes of Dravid, Ganguly, Sehwag and Tendulkar for their success. Sharing a dressing room with them, practicing in the nets with them, watching them up close, getting tips and advice - all these factors have played a huge role in their development. Rahul Dravid and Laxman will say they owe a lot to Sunil Gavaskar, Sachin Tendulkar and Azharuddin. You don't learn how to prepare for innings by just listening to your coach or reading a manual; it's usually by watching other legends doing it day after day. The next generation will say the same about Kohli and co. It's a cycle that will continue to help India produce world-class batsmen. Unfortunately we don't have such masters who our youngsters can look up to and learn from, but it will happen in the future. I am sure that there are already thousands of young boys who want to be the next Shakib (Mominul is an example), but Shakib himself has a long way to go. For now, the BCB can become proactive and bring some guys like Dravid and Ganguly as batting consultants, to work with our youngsters. Easier said than done, but BCB has already done this with Saqlain. In the past we have brought legends like Andy Roberts to work with our young bowlers (We all know the impact of that). We don't need high profile guys: once, Dave Whatmore brought in a specialist batting consultant called Owen Mattau, which immensely benefited our batsmen. We must also get the best out of our former players. Why not appoint Aminul Islam as a batting coach at our academy? Batting technique and skills must be taught at young age, preferably at school level. It is ridiculous if every national team coach has to teach the batsmen the ABCD's of batting. We were also lucky to have two batting coaches as our head coach for the past 5 years and our batting has improved significantly. Hopefully, the BCB will appoint a batting specialist, like they have done for spin, pace and fielding. The nature of our wickets is another factor - we all know how more sporting, bouncy tracks will benefit all our batsmen. An anchorman needs to have good technique and a strong mindset. We have the players who can play the role, we just need the team management to identify them, train them, mentor them and prepare them for it. They need to be informed this is the role they must play for the team and they need to work towards this goal day and night. The future is looking bright. Imagine a lineup with Tamim, Anamul, Mominul, Nasir, Shakib, Riyad, Mushifur. Never in our history have we had so much batting talent in the same team. But these talented guys need one guy who can always put in the anchor and stabilize the team. Will it be Nasir? Anamul? Mominul? With time we will find out. For the betterment of our cricket let us hope we soon get our very own Dravid, 'the Wall' that we have always been looking for. This page has been viewed 6184 times.